With only two games separating the third through ninth seed, the Spurs have a fist fight ahead of them. It’s difficult to put the Kawhi Leonard drama in the rear view. But inside the locker room, the Spurs have a more pressing issue. The team is dangling from the third-seed by one of Pop’s beard hairs, and two more losses could drop them down to the fifth seed. Things always look bleak during a four-game losing streak, but it’s time to face a sobering reality. Two games separate the Spurs from the ninth-seeded Clippers. 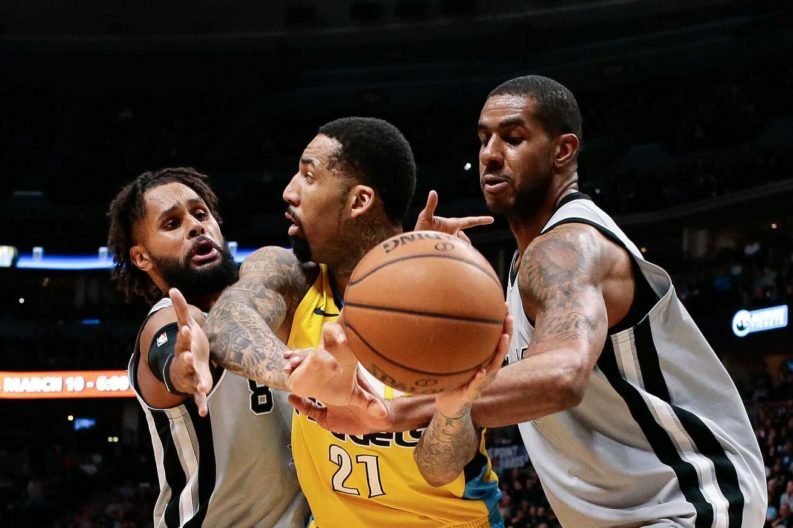 With 22 games left and one of the toughest remaining schedules in the league, the Spurs will have to scratch, claw, punch, kick, elbow and karate chop their way to a playoff spot. Worst-case scenario, the team could drop out of a playoff spot within the space of a week or two. Then they have two weeks at home in March. Two remaining bouts with Golden State and Houston aren’t ideal, but even without Kawhi, the Spurs are positioned to be able to secure a top-5 spot. Of course, health plays a role in their overall success. But if they string a few games together, a third-place finish isn’t out of the question. For that, they’ll need contributions from people other than LaMarcus Aldridge. The team’s success without Kawhi is contingent on the progression of the its youngest player. Dejounte Murray has been growing into his new role as starting point guard since he took the position Jan. 21. In his last 12 games as a starter, he’s averaging 10.7 points per game — more than three points higher than his overall season average. In addition to his unreasonably good rebounding ability, Murray gives the Spurs an unpredictable burst of speed and athleticism. For example, during Friday’s game against the Nuggets, he went coast-to-coast twice in the 2nd quarter. He’s learning more, day-by-day, about the intricacies of the offense from Tony. Others will have to step up if the Spurs want to make any noise in the playoffs, but Dejounte is the only true wild card on the roster in terms of value. The playoffs feel like a long way off anyway. Right now, the Spurs are going to do what they do best: work in silence.